Bug, Boo, and Bean: What's in YOUR Emergency Kit? What's in YOUR Emergency Kit? 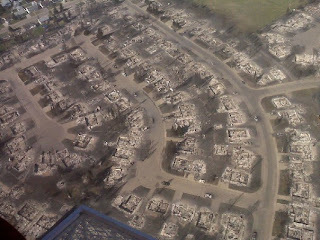 Over the weekend, out of control forest fires ripped through the Alberta town of Slave Lake. 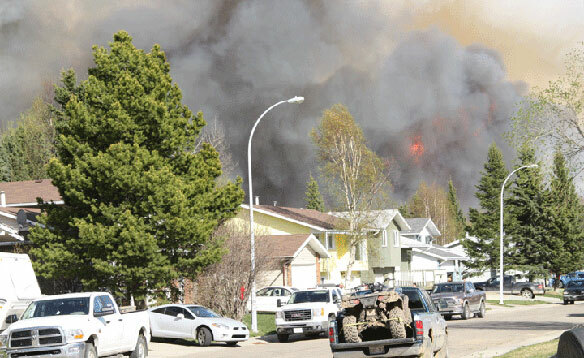 Extreme winds spread the fire quickly and hampered efforts to contain the blaze. 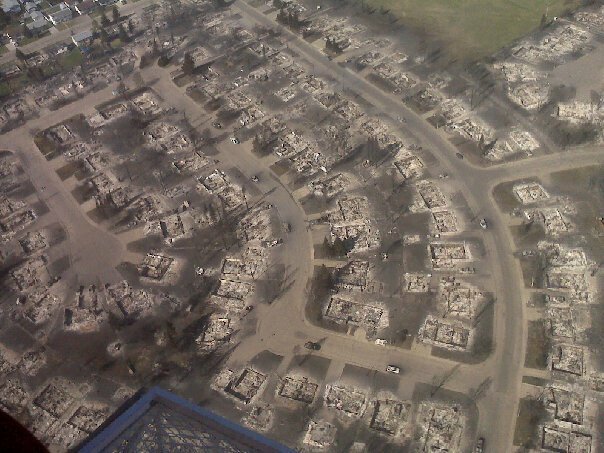 About 40% of the town was destroyed, including the brand new Town Hall and Library, a car dealership, the radio station, and entire neighborhoods. I won't tell you exactly where I live - though thankfully, i'm not in Slave Lake - suffice it to say that we are close enough to smell smoke. I used to go shopping in Slave Lake regularly. This town of 7000 people was evacuated, and more than 3000 more were evacuated from surrounding towns. There was enough notice given that everyone made it out safely, but hundreds of homes were completely destroyed, with nothing but the ash-filled foundations left. As a member of the Church of Jesus Christ of Latter-Day Saints, I hear the constant counsel of our Prophet on emergency preparedness: food storage, 72-hour kits, etc. Never have I thought too deeply about it until today. I watched every update, in shock of the disaster, and keeping track of the other fires to see if they were getting close to us. I couldn't sleep that first night. I prayed often for these people who have lost so much, and for the continued safety of everyone involved, particularly the firefighters. And as i watched, i thought, "What would i take if the call comes to evacuate my town?". I made a mental list of things we would need, and things i would like to save, and realized that in the heat of panic, i probably wouldn't remember and/or be able to find many of the important things, such a legal documents for our home and insurance, identification and vital statistics, and backup discs of all our photos. As i discussed it with my husband, we realized the need to have "Grab-and-Go" kits - supplies already packed together and ready in case we have to leave our home in a hurry. We have a 72-hour emergency kit filled with supplies for an emergency where we would be stranded somewhere away from civilization, but i thought it important to gather some basics as well, like normal food, bottled, changes of clothes, petty cash, diapers, toiletries... things that we might forget in a panic, or might take too long to gather. So many of these people lost so much - some of them were left with just the clothes on their back. As a mother, i want to make sure my children are provided for no matter what our situation, and the thought that we might lose our home, and all we're left with might be whatever we can pack into the van was terrifying. Many of our things can be replaced, but what if i forget some of those things that are irreplaceable? What if we get stuck somewhere and can't make it to an evacuation center? Natural disasters are becoming more an more common - earthquakes, tsunami, floods, wildfires, tornadoes... The Last Days are here, and I can't keep pretending that out here in a small, landlocked, prairie town we are safe. Stocking food storage is extremely important, but these days i'm thinking that a well-stocked 72 hour kit is even more important - large enough for your family, but small enough to pack up quickly if your house catches fire, or some other disaster devastates your home. So my question is, do you have a 72-Hour kit? What kinds of things do you have in it? We're just staring ours so not much right now. We're making a main one for home, a smaller one for N's office and one for our vehicle because you never know when something might happen.